Welcome to the age of technology! Oh, you have been here for a while? So you must also have charger wires everywhere for mobile devices and other clutter related to the wireless world? Well we have come up with a few simple ideas to consider when designing and remodeling your kitchen. 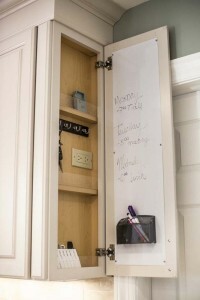 Conceal outlets in cabinets: the picture above and below shows two ways to hide those wires needed to charge devices. We all put them in our kitchen in the same spot (usually on the counter) so we don’t forget where they are. Imagine your new kitchen having that spot in a cabinet and hidden. Create a “Drop Zone”: “Drop Zone” is a modern day buzz word. It literally means a spot to drop anything you walk with in your hands. 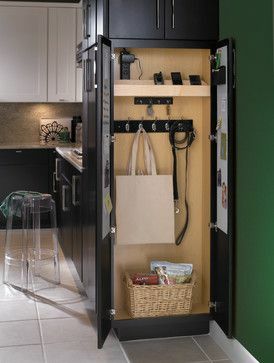 For most of us, this in the countertop or mud room bench or dining room table…wherever we can land these items safely and be able to find quickly. With smart design, this “Drop Zone” can be incorporated into your cabinetry. It can be a life changing decision! 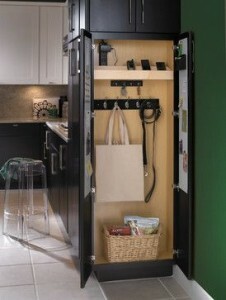 Use slim end of run pantry to create a mobile device charging station, message center and hanging storage. Baskets and Cubbies: sounds simple, but is it really? If you plan for certain sized baskets and create cubbies that meet your daily life, it is simple. 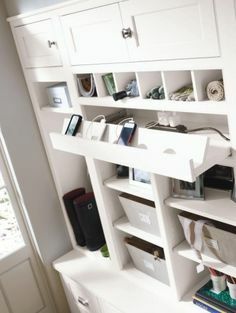 Baskets in a cubby are easily accessible and hide the mail, extra plugs, ear buds, etc. Cubbies work great for shoes, umbrellas and other bulky items. Don’t forget hooks too! You can hang school bags, jackets and even you purse. Grab and go! This entry was posted in Designer's Journal and tagged 19063, appliances, cleaning granite, design/remodel, designing a kitchen in Broomall, drop zone, fresh kitchen, kitchen and bath design, kitchen design, kitchen design Newtown Square, kitchen remodel, kitchen remodel Bryn Mawr, kitchen renvo, kitchen renvo Bryn Mawr, kitchen technology, kitchens, kitchens 19008, kitchens 19073, PA, storage, storage solutions, technology in a kitchen on October 15, 2015 by Steph Gillin. Biggest Kitchen Design Trend of the Year 2016? Hire a professional remodeler, the benefits are endless! Patch.com Springfield highlights Grande Decor’s Blog! Picking a Paint Finish…made easy! ©2019 Grande Decor. All Rights Reserved.